North Boulder residents are gearing up to express their desire for a library in their neighborhood. Since 1998, a branch of the Boulder Library was promised at a location owned by the city. Initial funding was in place but through inaction was lost over the past 14 years. North Boulder residents feel that the library’s time has come. To demonstrate their interest in siting a library in North Boulder, actions have included an April 28 event for One Book 4 Colorado sponsored by the Boulder Library and attended by council members Tim Plass and Lisa Morzel. The event was held at the proposed library site at 13th and Rosewood. The site is centrally located between the future Violet Crossing neighborhood, Uptown and Boulder Meadows Mobile Home Park. This location serves the diverse residents of North Boulder. An alliance between NoBo Art District and the North Boulder Library Group was formed in early summer to develop plans for Little Lending Libraries to be sited throughout North Boulder. 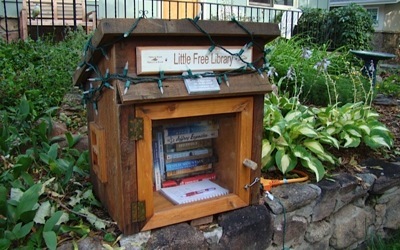 These popup libraries are found all over the world including the Flatirons Neighborhood in Boulder. 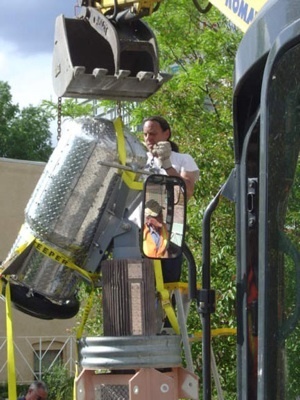 The mission of NoBo Little Libraries is to build community with neighbors and artists with the hope of one day having a branch of the public library in North Boulder as well as making North Boulder a center for the Arts. The little sculptural libraries will work on the honor system. You may borrow books, games and art. Everyone will be encouraged to donate books and games. Local artists will donate original artwork that can be checked out. A call for Little Lending Library design entries to artists went out in early July and three designs were selected. The kick off event for the first installation will be at Lucky’s Market on Saturday, September 22 from noon until 4:00 p.m. Lucky’s Market will host a barbecue with proceeds going to the first Little Lending Library costs. The artist, Jimmy Descamps, will be on site with his work in progress. Children of all ages will be encouraged to come and participate with the artists in the finalization of the project. Emmy award winning singer and songwriter Dave Williams will be performing. The installation event of the project will begin at Lucky’s Market on Sunday, September 23 at 10:00 a. m.
North Boulder residents are excited about this project and looking forward to building more Little Lending Libraries over the next year. Our goal is to bring attention to the need for a permanent branch library/resource center in North Boulder. This project also represents an exciting opportunity to promote and exhibit public art in Boulder. The collaboration between a local business like Lucky’s Market, NoBo Art District and the North Boulder Library Group is a building block for future community-based art projects. Projects like this have energized the community which continues to wait for long over-due amenities in North Boulder.